What’s worse than staying alone in a new place, a new town? Maybe staying alone in an old hotel room on the sixth floor. What’s worse than staying alone in such a room? Realising that you may not be alone as you think you are. Few places take you by surprise as soon as you land there. The hotel room that I checked in at, near New Delhi Railway station was one of those. Not that it looked scary even a bit, but there was something bizarre about the place. Strange in a familiar way. I knew that I know a fair bit more about this place than meets the eye, the moment I checked in there. Delhi was still half having forty winks when I arrived there. ‘5.30 am’ read my wrist watch. After a couple of negotiation rounds with the cab driver, we managed to settle for an amount which was much closer to what he had stated. But then he dropped me right outside the hotel if that was any consolation prize for me. I paid him the agreed amount and picked up my luggage. My eyes were still trying to read the faces and the places around. After all, it was my first time in the capital city. But I could tell that not much had changed in this city for a long time, just by looking at it. After getting done with the formalities at the reception desk, I pushed my luggage at one corner of that spacious hotel room. “This hotel had been in existence from over a century now…right from the British era. Many prominent British and Indian personalities would stay here back then” a guy with thin-framed spectacles sitting at the reception desk said with immense pride. I greeted him with a forced smile and entered my room. The door got latched behind a strong gust of wind. I took my pants off and hung them on the sofa chair. The shirt was thrown on the bed. My hands desperately rummaged through the suitcase for boxer shorts for I needed nothing but the comfort that time. I threw myself on the cosy bed and took a last glance around the room. The room was spacious, and the furniture was in tune with the building’s architecture – reminiscent of the British era. It almost replayed the receptionist’s description of the place in my head. The room had dim lights. It had a tube light straight above one edge of the bed; it had a central fan and an air conditioner which seemed to be working all right. A study table waited in silence at one corner of the room near the window. The bathroom was big enough, and more importantly, it was clean. And yes, a double bed to myself. I don’t remember when I dozed off. It must have been good four hours or so which took much of the stress of last night’s journey off my body and my mind. When I opened my eyes, the first thing that I noticed was the archaic dark-brown wall clock. It was 10.20 am. The temperature inside the room had fallen to 19 degrees thanks to the strong air conditioner. A splash of cold water from the wash basin threw me back into an awakened state. I looked around the room. The place had something that felt so much familiar. Was it the maroon paint on the walls which matched my bed room’s colour? Was it the curtains or the antique wall clock just above the door of washroom? All these possibilities were rejected after a brief period of thought. But there was something that had dragged me all the way to this place, to this town. As if it was calling me all this while. I could almost hear whispers echoing in every corner of that room. Those four walls around – I knew them somehow. I felt like I had been familiar with every corner of this room. It smelt of jasmine flavoured room freshener that the room service boy had sprayed only recently. But there lingered another smell in its crevices. A scent of burnt gunpowder and books. The musty old manuscripts. I felt dizzy with the whirlwind of thoughts in my head. I held my head with both hands and tried in vain to calm it down. My mind was going frenzy with a storm of thoughts about this place. The sweat dripped down my chest. I got up and took a glance around. On the left side of the centrally-placed double bed, there were two seven feet tall wooden cabinets. The wall on the right side of the bed was mostly conquered by satin red curtains dropping down all the way to kiss the floor. They were hiding something secretly behind. Something that I had to see right now. I had already taken on the role of a detective ever since I arrived here and had almost forgotten about writing the travel blog. My hands rummaged around and felt a hard surface behind the curtains. I pushed open the curtains, and there it was – A small window in the centre. It had thick ornate borders and two strong bolts, one at the top and the second at the bottom. Why was such a window being hidden I asked my over-intrusive mind. Before it could answer, robotically my hands tried to unbolt the doors of the window, and they did succeed with some strength which showed that it had not been touched for quite a while. As it opened, the rubble of dust and paint came sliding down to the floor. With both arms wide stretched I pushed the doors of the window out wide and a dazzling flash of light blinded my eyesight for few seconds. Along with it came a cold breeze of air sneaking inside the room, as if it had been waiting to enter it from a long time. I looked outside, and that view had the power to pause my heartbeat for a brief time. I was enthralled. It was not how this city looks like. Few horse carts moved slowly down the road. There were fewer people on the street than usual. There was a small tea stall around the corner. There was a British style restaurant that my eyes somehow had skipped while checking in this hotel early today morning. There was also a bullock cart making a slow progress along the road and the houses around, the tiny brown houses with slanted roofs. But that was not all to this strange bucolic sight. What particularly caught my attention were two men in long overcoats. Both were standing on opposite sides of the road – The one with his back to my hotel building and the other one whom I could see more clearly because he was facing the hotel. He was an Englishman. He looked like one for sure. A man of more than six feet height approximately, with a moustache and dark golden brown hair curling down like sea waves down till his neck. With every intermittent pause between the successive drags of the pipe in his left hand, he looked at the man on the other side. And that man that other man who was wearing a black big-sized hat either failed or pretended to not having noticed the Englishman on the other side. He simply kept watching the road as if he was desperately waiting for someone to arrive. My eyes swung from Englishman to the man with a hat and back to the Englishman like a spectator at Wimbledon watching a tennis match. The man with a hat frittered away his time by looking at his watch, then at the sun with a frown and again back on the road. As he looked up, I tried to get more of his face, but it was eclipsed by the hat over his head and the sunlight falling on it. And then, there came a big horse cart which came to an abrupt halt just a few steps away from where he stood. This horse cart was different from the other ones in a sense that it had a nice roof and the cushion seats inside. I could even see a kerosene lamp hung on one side. A scene right out of a Tarantino movie. The man with a hat now stepped ahead after adjusting his coat a couple of times and walked straight towards the cart. He picked up a parcel in a fashion that said it wasn’t the first time he was executing such an act. A brown envelope was given by hands that stretched out from the cart. The man bowed down a bit while simultaneously lifting the hat over his head. It was followed by an immediate waft of a hunter rope on the horse’s back that did the job. The black horse flared its nostrils, neighed and galloped ahead. A small cloud of dust followed the cart, while the man with a hat quickly verified contents inside the parcel. Smiling, he now turned. He turned towards the hotel and looked straight up. Up at the very window, where I was standing. Before I could study his face, my spying mind was shocked by the sound of a gunshot. It had taken no more than few seconds for a bullet to travel from the pistol of the Englishman on the other side of the road and it to pierce the back of this man with a hat. He fell on his knees and with a jolt of that shot his hat fell off and so did the parcel from his hands. He looked up at the sky and the window. Pupils in my eyes widened up. I had seen that face. I had seen it more than once. For it belonged to me. I saw myself in that black overcoat looking up at the window, at myself. I could see myself falling on knees, with the blood oozing through my chest. Dying slowly with every second that passed. 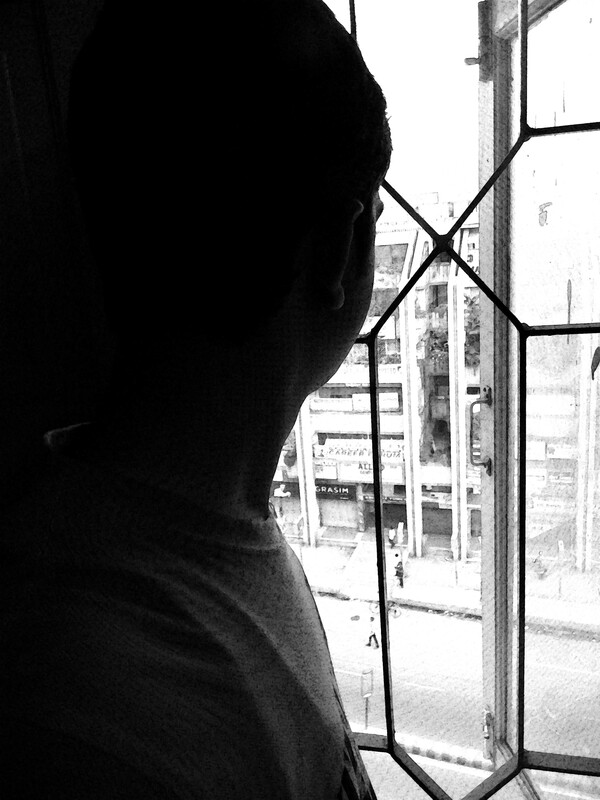 I stood still like a wax statue at that window and watched the strange scene unfold in front my eyes. A scene that had transcended the barriers of time and a window that drove me into a time travelling ride. I closed my eyes and pinched myself. I opened my eyes to a blurred vision of the deluxe room. I got up from the bed, and the old-fashioned wall clock caught the attention of my half sleepy eyes. ‘10.20am’! With an immediate impulse, I turned right to find the satin red curtains. Air thrown from the ceiling fan above moved them rhythmically like a billowing skirt over an air-vent. And I could hear them whisper gently. They were calling me to open the window behind. To steal a look into another world. To watch the man with a black hat getting shot. To watch myself die. What were the possibilities? What choices did I have? I decided that I had to save myself from dying this time from getting shot. Little did I know that it would repeat itself somehow. Little did I know that I was stuck. Stuck in a loop.